Today, ArtWorks’ CEO and Artistic Director Tamara Harkavy announced that the internationally celebrated Brazilian street artist Eduardo Kobra has been selected to create their largest mural to date in downtown Cincinnati, thanks to support from Fifth Third Bank. Kobra chose to honor astronaut Neil Armstrong, the first person to land a craft on the moon and walk on its surface in his design. Following his career at NASA, Armstrong was a professor of aerospace engineering at the University of Cincinnati from 1971‒79. 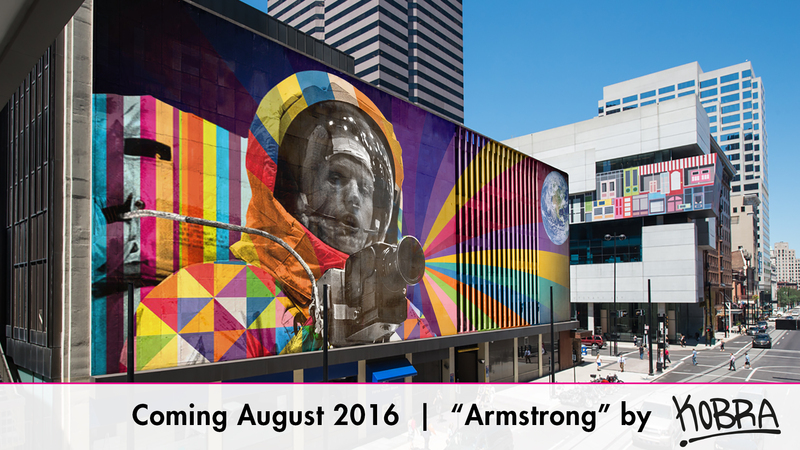 Born in Wapakoneta, OH, Armstrong lived in Cincinnati at the time of his death in 2012. The monumental tribute to be located at 511 Walnut Street, measures 7,632 square feet and will be painted by Kobra assisted by four ArtWorks teen apprentices. The painting will take place August 8‒20, with a public dedication on August 21. The project will be livestreamed on https://www.artworkscincinnati.org/. The design concept released today is in Kobra’s signature style: figures depicted in a dynamic combination of photorealism, bold colors, and kaleidoscopic patterns. Armstrong is depicted in in his space suit holding a camera. His face, the shield of the helmet, and the camera are black-and-white. The space suit is an exuberant patchwork of brightly colored triangles and stripes. A spectrum of bright colors forms a rainbow effect emanating from the camera lens. Planet Earth, what Armstrong once called when describing his view of it from space “that tiny pea, pretty and blue,” is in the distance. ArtWorks will paint 23 murals this summer, bringing the total ArtWorks mural count to 125.